There was one cookie that I gave on my cookie platters this past Christmas that I didn't get a chance to post before Christmas. They are a simple cookie to make, and they aren't Christmasy; so you can make then year round. 2. Cream the butter, sugars, and vanilla together. 3. Mix in flour, baking soda, and salt. 4. Mix in one egg at a time. 5. Stir in chocolate chips, and crushed potato chips. 6. Place a scoop of dough (about 2 tablespoons) on a parchment lined baking sheet. 7. 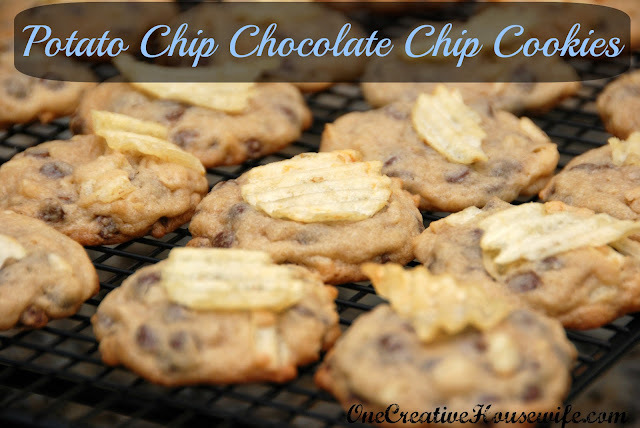 Push a potato chip into the top of each cookie. My husband liked these cookies just the way they are, but I think the next time I make them I will try milk chocolate chips instead of semi-sweet.